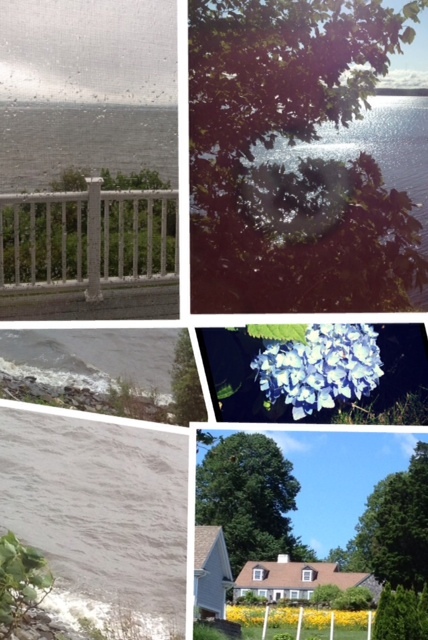 Last week I was on a “break” in Rhode Island…where I go from time to time to relax and stir up some creative thoughts. Spring has come along the Rhode Island coast line… it is beautiful to experience the chirping birds, the cry of the sea gulls and the off shore breezes. Sunrises never cease to be a grateful view. The ever-changing water currents and winds bring daily weather changes, sometimes ones that are very slight and hardly noticeable and others, dreary and full of drama. We had one such dreary and dramatic day…a Nor’easter which hit us early one morning with pounding rain and whistling wind. The waves were tumultuous and white caps made for ominous boating conditions. It was a day for soup, sandwiches and a good book…as well as make-believe play and a trip to the Children’s Library in between wind gusts. The next morning…it was like the day before had been a dream. The sky lit up at around 5 a.m. and the sun shone brightly another hour later. The Wind had subsided.The birds were back and the water sparkled with its calmness. Boats were cruising again. It was a Jekyl and Hyde couple of days…on the coast of Rhode Island!